(Photo: Tom Casino/Showtime) LAS VEGAS (Sept. 8, 2012) – Lucas Matthysse powered his way through previously undefeated Olusegun Ajose to claim the WBC Interim Super Lightweight World Championship Saturday night on SHOWTIME® from The Joint at Hard Rock Hotel and Casino in Las Vegas. Matthysse’s power proved to be too much for the game Ajose and after a fantastic display of courage from both fighters, Matthysse scored a fight ending knockdown at 2:59 of the 10th round. In the co-feature on SHOWTIME CHAMPIONSHIP BOXING, up-and-coming prospect J’Leon Love stepped into the spotlight and claimed the win over fellow prospect Ramon Valenzuela by disqualification due to unsportsmanlike conduct at 0:37 of the eighth round. 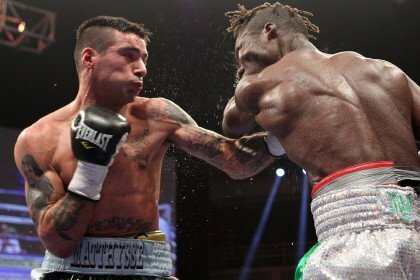 In the main event, Matthysse proved to be stronger and faster from the opening bell. Matthysse, who has had great success against left handers, stayed busier throughout and landed punishing combinations against his southpaw opponent. But Ajose showed his mettle and proved his toughness and resilience by staying on his feet through the biggest punches Matthysse could dole out. As the rounds went on, Ajose tried to keep his opponent at a distance, but Matthysse continuously broke through, often attacking the body before going for the head. While neither fighter had ever been knocked down, Matthysse’s strength sent Ajose to the canvas in the tenth forcing referee Russell Mora to step in and halt the action. It was the first loss of Ajose’s professional career. In the opening bout on SHOWTIME, the undefeated Love took on Valenzuela in the first 10-round fight of either man’s career. Love was the busier and more accurate puncher throughout. Valenzuela, becoming visibly frustrated by his opponent, lost control. After several warnings for multiple indiscretions including holding and not stopping on a break, referee Jay Nady deducted a point. At 37 seconds into the eighth round, Nady stopped the fight when Valenzuela lifted Love off his feet in a move that seemed more appropriate for a mixed martial arts bout than a boxing match. At the time of the disqualification all three judges had the bout scored 70-62 in favor of Love. Saturday’s fights were presented by Golden Boy Promotions in association with DiBella Entertainment, Gary Shaw Productions, Arano Box Promotions and Mayweather Promotions and sponsored by Corona and AT&T. SHOWTIME CHAMPIONSHIP BOXING returns next Saturday, Sept. 15 when Mexican superstar Canelo Alvarez defends his WBC Super Welterweight World Championship against upset-minded breakout star Josesito Lopez live on SHOWTIME at 9 p.m. ET/6 p.m. PT. In the co-featured attractions, WBC Featherweight World Champion Jhonny Gonzalez defends his crown against former World Champion Daniel Ponce De Leon, former World Champion Marcos Maidana faces perennial contender Jesus Soto Karass in a 12-round fight for the vacant WBA Intercontinental Welterweight Title and Leo Santa Cruz defends his IBF Bantamweight World Championship against former Two-Time World Champion Eric Morel. Preliminary fights will air live on SHOWTIME EXTREME® at 8 p.m. ET/PT. Next Saturday’s event will take place at the MGM Grand Garden Arena in Las Vegas and is presented by Golden Boy Promotions and Canelo Promotions in association with Goossen Tutor Promotions and Thompson Boxing Promotions and sponsored by Corona, DeWalt Tools, AT&T and O’Reilly Auto Parts. Next boxing news: How would tonight’s Andre Ward match up against the Joe Calzaghe who beat Mikkel Kessler?